I made chocolate cookies a few days ago. When I say “I made,” I mean I opened the package of refrigerated dough and followed the directions. I have made chocolate chip cookies from scratch before, and done a pretty good job if I do say so myself. But why bother? The refrigerated dough turns out almost as good, and take a whole lot less time. And less dish washing, too. Along with the fun of eating them (since I’m the major cookie consumer in our household), I gained something of an insight for speaking and writing. (Does that make the cookies tax deductible?) Since they were “home made,” I put them into a Ziploc bag after they cooled, and when I ate the last one few hours later, I noticed a lot of crumbs in the bottom. In fact, there were enough there to make up two entire cookies after I dumped them out into my hand. 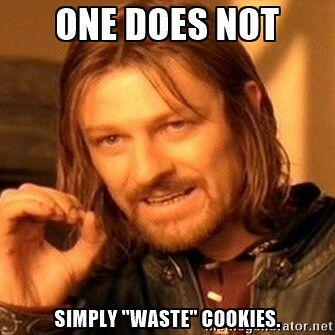 One does not simply waste cookies. Give credit for anything you get from someone else, and if you really can’t find a story of your own, it’s better to use someone else’s story than to have no story at all. But everyone has crumbs in their life. You do, too. You just may not value them–may think they’re just for throwing away. Your own story will have more punch, and no one else will have already told it. You don’t have to make it your own–it is your own. You just have to gather them up. Don’t let the crumbs in your life go to waste. Or the cookies, for that matter.